In an extension of a study of the Brighton & Hove Bus and Coach company fleet in partnership with HORIBA, Ricardo research has shown that some of the oldest vehicles can also be the cleanest, if retrofitted with the latest low emissions exhaust aftertreatment technology. 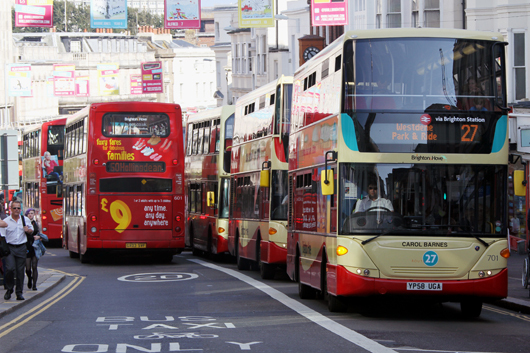 As part of a research project examining the real-world emissions of buses operating through a known pollution hot spot in Brighton city centre, Ricardo published results earlier in the year demonstrating the important role that improving traffic flow can have upon reducing NOx emissions. The study, the findings of which were reported in July, focused on a range of buses including Euro IV, Euro V conventional and Euro V hybrid powered vehicles. As a follow-up to this work, Ricardo has since carried out measurements on an older Euro III bus that has been recently retrofitted with a selective catalytic reduction and continuously regenerating particulate trap system. Testing of the older retrofitted vehicle was carried out on exactly the same route (No.7) as used as the basis of the previous study. This route traverses Brighton and Hove through the air quality hot spot of North Street in the city centre, and covers a total of 18km (9km in each direction) with significant gradients throughout. The bus was instrumented with HORIBA’s advanced Portable Emissions Monitoring System (PEMS) equipment and artificially loaded with ballast representing a 70 percent passenger load. Multiple trips were conducted in normal traffic during business/shopping hours, stopping at regular bus stops in a similar manner to the normal passenger service. In addition to highlighting the significant influence of route topology and traffic congestion in driving NOx emissions, the previous study had observed the expected trend of the latest vehicles generating the lowest emissions when the whole No.7 route was considered. 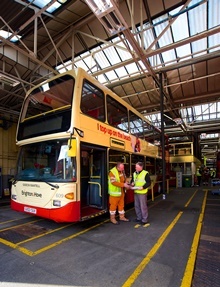 In contrast, however, when averaged across the route – and also for the section through the North Street pollution hot spot – the total emissions results of the Euro III retrofitted bus were substantially below those of all of the other buses tested, including the Euro V hybrid vehicle. Data also indicated that of the nitrogen oxides remaining in the exhaust, the NO2 fraction was substantially lowered to below 10 percent of total NOx. Significantly from an operational standpoint, however, the retrofitted aftertreatment system required a considerable period of warm-up before its full emissions control functionality could be achieved (typically 5 - 10 minutes from cold start). This may have implications for bus operators with depots in, or close to, low emissions zones. Scope was also seen both for further optimization of the system calibration by improving the dosing of the SCR system in uphill stop-start traffic, and improving thermal management of the exhaust. A full copy of this press release is available from the link at the top right of this page. A selection of high res images from the PEMS project is also available from the previous release on this project.